MATHIAS EDWARD “SCOOTER” FRIES - “Scooter” Fries is not only one of the most titled cowboys in Bandera, he is one of the best known and recognized. Scooter was a true child prodigy in the world of rodeo calf roping. From the tender age of five, under the tutelage of his Uncle Bennie Adamietz on whose U Bar Ranch he was born, Scooter was roping and catching calves. By the time he was eight years old he was giving roping demonstrations not only at home at Mansfield Park in Bandera, but in San Antonio and other South Texas cities. 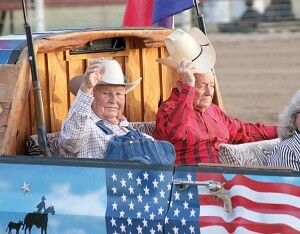 In 1948, Governor Coke Stevenson presented 15 year old Scooter Fries with his first state championship as a youth roper. That title was followed by three others, a national championship and reserve championship and even a championship in steer wrestling. Of his induction into the Frontier Times Museum’s Texas Hall of Heroes on the National Day of the American Cowboy, Scooter Fries say, “You know, the town really didn’t take all that much notice of us way back then, but it sure is nice to be recognized now.